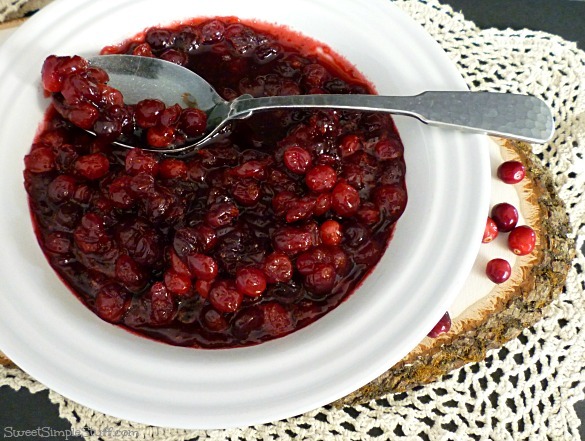 Cranberry Sauce … homemade or canned? My grandma always used canned and that’s what I did … until a few years ago. We always had the whole berry variety for Grandpa and jellied for the rest of us. I was young and helped out a little in the kitchen … my personal goal was to slide the jellied sauce out of the can in one piece, so that the lines on the can left an impression on the cranberry sauce. Then I would slice it and try to fan the slices on the plate to look pretty! Then I grew up … learned to like whole berry cranberry sauce and eventually made it myself! 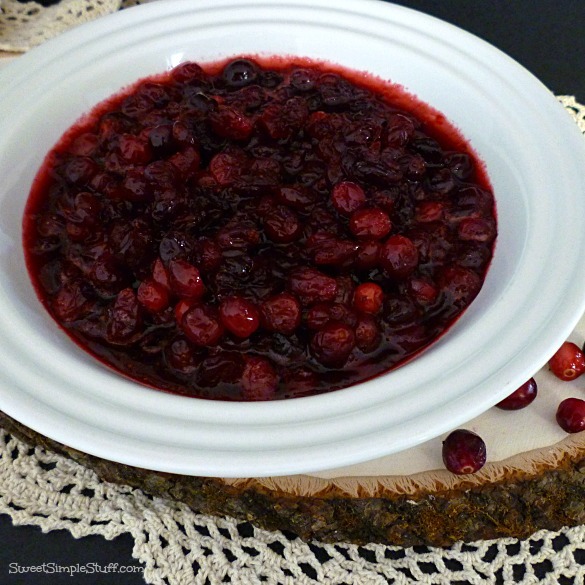 Cranberry sauce is so easy to make … can’t believe that it took me so long to give it a try! It can be made a day or so ahead and kept covered in the fridge … very convenient for the busy holidays. Since fresh cranberries are not always available … I buy a big bag at Costco and divide it up into 12 ounce bags and freeze them, so that I always have cranberries available. Pick over cranberries … look for stems and any possible bad berries, then rinse. Combine all ingredients in a medium (2 to 3 quart) sauce pan. Bring to a boil over high heat, stirring occasionally. Reduce the heat to medium and cook, stirring occasionally, for 5 minutes, or until most of the cranberries pop. The sauce will be slightly thickened. Remove from heat. Transfer the mixture to a serving bowl and cool to room temperature. Cover and refrigerate until ready to use. The mixture will thicken as it cools. Makes 2 cups. I like to have a little cranberry sauce on each bite of turkey … how do you eat your cranberry sauce? You know that I ♥ your comments! 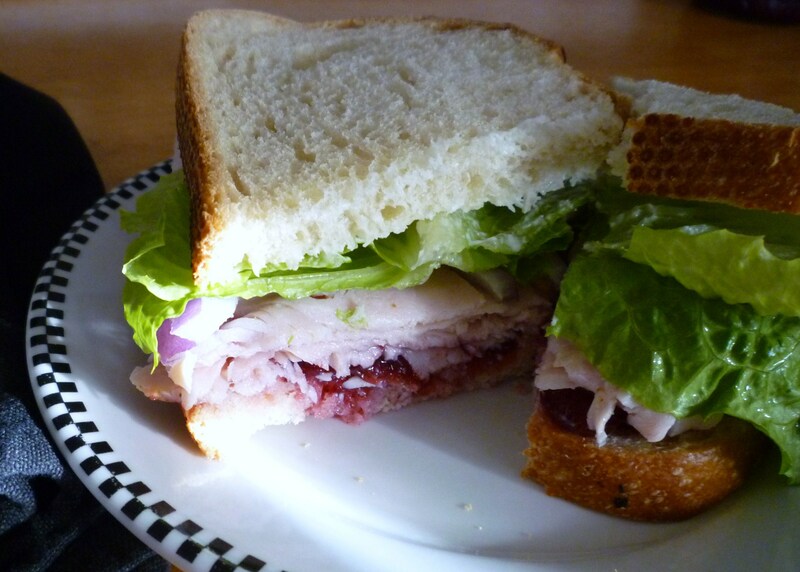 Mix cranberry saude and peanut butter together for a wonderful sandwich . Should be sauce not saude. Sorry for the typo. We have only had the Cranberry’s in the can. I will share this with my family & friends. Thank you for sharing this with us. I do know that this wish is just a tad early ,but I want to wish you all a very Happy Thanksgiving. I wish Sam’s Club sold the 3lb. bag of cranberries as I have been wanting to make some homemade canned Cranberry Jelly/Jam. I’m just waiting to see if anyone has them on sale and will buy up a bunch and store in freezer. I froze my cranberries and I’m thinking about buying more … looking for the sale too! 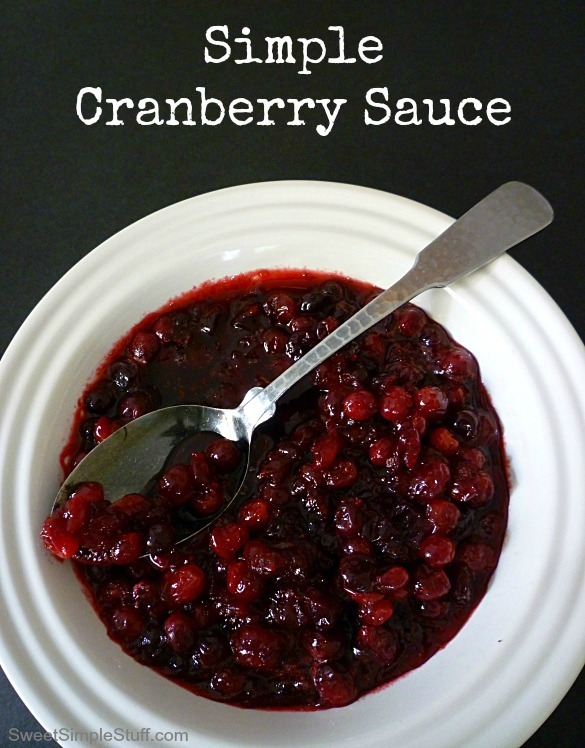 I’ve always made my own cranberry sauce since it is so easy & keeps well. Sometimes I leave it as whole cranberry sauce & other times I run it through a colander and have jellied sauce which I put in a small loaf pan & chill. Then it is easy to unmold & slice in pretty servings. I’ve also made it in a small mold that is pretty when served unmolded on a bed of lettuce. Happy Thanksgiving to all! Looks so pretty! The only person who likes the berry kind is my SIL husband. I will make a special treat for him this year with a fresh batch! Thanks for sharing your recipe with us! Happy Thanksgiving! Thank Lizy 🙂 I hope your hubby appreciates it! We always make our cranberry sauce but I have never even thought about using brown sugar! Will give that a try for Thanksgiving this year! Orange jest is very tasty with it too! I like orange zest too 😉 Give the brown sugar a try … it gives a little different flavor!